About three and a half years ago, I got an email from Bonnie Rosenbaum, the Director of Communications at Keshet, where I sit on the board. CJP was holding a meeting for area organizations to come learn about a new project they were developing called JewishBoston.com. Could I attend on Keshet’s behalf? I had no idea how that meeting would change my life. Patty Jacobson and Liz Polay-Wettengel, the co-founders of JewishBoston.com, presented their vision of how this website could change our community. They outlined a tool to level the playing field for synagogues and other organizations to get their information out to the public, a portal that would lower the barriers to entry to the Jewish community. They shared a dream of making the Jewish community a little bit friendlier and a lot easier to join. At the end of the meeting, I ran up to both of them, introduced myself, and asked how I could get involved. At that time, there wasn’t a committee I could join, but they took my information and promised to keep in touch. A few months later, they reached out to me for help. They were looking to hire an editor, and they knew I had great contacts in the Jewish blogosphere. Did I know anyone who wanted the job? Of course I did—me. The only problem was that I wasn’t looking for a job. So I tried really hard—really hard—to find someone else for the job. Because I needed the temptation to go away. But time passed and the job remained open, and I realized I needed to throw my hat into the ring. I became editor of JewishBoston.com on June 7, 2010, the day after I graduated with two masters degrees from Hebrew College and presided over my fifth Prozdor graduation. My first day on the job, I didn’t even come into the office. In a twist of fate, I had to staff the JewishBoston.com table at a CJP conference for Jewish Educators, putting me in the position of demonstrating my new job to my old colleagues. In the intervening years, JewishBoston.com has grown and evolved in exciting ways. In my early days with the project, Patty would get aggravated when she’d periodically ask me my favorite thing about working on JewishBoston.com and I’d tell her it was the team of people we comprised. “I want your favorite thing to be the impact we’re having!” she’d protest. The truth is, I can have it both ways. I’ve been blessed to be part of an incredible team here, from my start with Patty and Liz, to the team I’m leaving behind with our web developer Alex, community manager Kali, project manager Zachary, our fantastic columnists, committed volunteers, and extended CJP colleagues — in particular, the team behind The Network, and CJP’s Associate Vice President of Stategy Implementation, Karyn Cohen, who oversees our work on JewishBoston.com as part of CJP’s broader commitment to Jewish connection and engagement. I couldn’t dream of a more invested, capable, and creative group of people, and it’s been a joy to work with them. And what an impact we’ve had! From the hundreds of people holding their first-ever Passover seders thanks to Seder in a Box to the thousands of people world-wide reciting words I wrote at their seders with our Haggadah, the people across greater Boston who’ve tried out an event or organization they wouldn’t have known about without JewishBoston.com and my colleagues at other Jewish organizations who’ve made significant strides in their own abilities to reach new audiences… I kvell. So the decision to move on from JewishBoston.com—and from Jewish Boston as a whole, as I pack up my life and start anew with an apartment in Brooklyn and a position at the Shalom Hartman Institute of North America—was not an easy one. 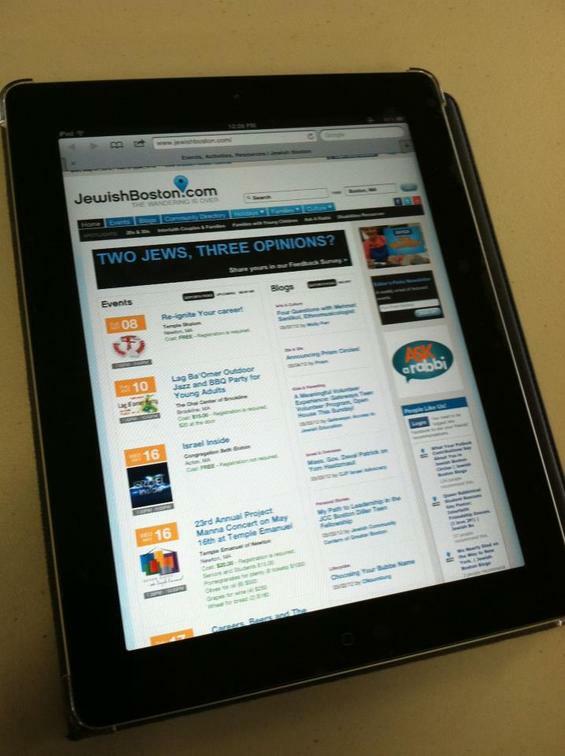 I love JewishBoston.com and the Jewish communities I’ve been a part of in the greater Boston area. But I am confident that I leave you in good hands, and that both work and family will bring me back here regularly. Keep in touch. You can always find me on Twitter. And despite what it says at the top of the page, if your wandering brings you my way, make sure you look me up.